1898 Georgina M. Holt is hired as the first business teacher at Oklahoma A&M College. She resigns in 1903 to marry Dr. Lowery Layman Lewis, who was instrumental in getting the School of Commerce and Marketing established. 1914 The School of Commerce and Marketing is established at Oklahoma A&M College. 1915 Professor H.W. Moorhouse is appointed as the first dean during the 1915-1916 academic year. Willard Rude joins the faculty, serving as department head from 1920 to 1945. He wins the trophy in a yearly contest for shorthand penmanship sponsored by Gregg Publishing Company so many times that the company was forced to retire the trophy to Rude. The first bachelor’s and master’s degrees are granted by the School of Commerce and Marketing. 1922 The School of Commerce and Marketing records the largest enrollment of any of the six schools on the campus, and it moves into its first official building, the Old Engineering Building. 1924 The School of Commerce and Marketing becomes known as the School of Commerce. Morrill Hall becomes the home for the College of Business Administration. The building was originally built in 1906 as the administration building for the ever-growing Oklahoma A&M College. Raymond D. Thomas becomes dean. He eventually retired in 1957 but his 28-year tenure is the longest tenure of any dean of the Spears School. The faculty in the School of Commerce consists of 19 members. The School of Commerce becomes the Division of Commerce. With the end of World War II, enrollment in the School of Commerce increases dramatically as soldiers return home, tripling between 1945 and 1946, and almost reaching 2,000 by 1947. The Business Extension is created with Harry Canup named as director. Today, the outreach portion of the Spears School is the Center for Executive and Professional Development. The Division of Commerce becomes known as the Division of Business. Eugene Swearingen replaces Raymond D. Thomas as dean, becoming the first new leader since Thomas was named in 1929. The Division of Business becomes the College of Business. The Ph.D. program in economics is the first doctoral program in the College of Business Administration. The first three students in the program were, from left, Richard W. Poole, Duck-Woo Nam and Robert L. Sandmeyer. On Dec. 9, the groundbreaking of the current Business Building is held as OSU celebrates the 50th anniversary of business education with a golden anniversary celebration. The building officially opens in the fall of 1966. Richard W. Poole becomes dean. He resigned the position in 1972 to become vice president for University Relations and Development. His contributions to the college and the university are countless. The College of Business becomes known as the College of Business Administration. A tornado sweeps through Stillwater and the OSU campus on June 13. 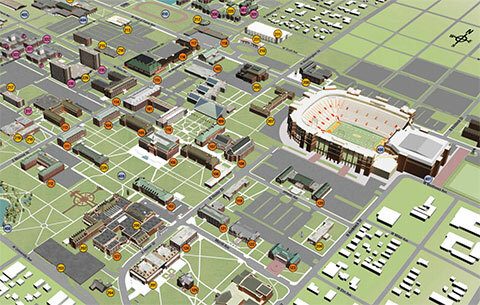 The storms path cuts across the OSU campus with the College of Business Administration building in its path. Fortunately, there are no human casualties but damage to the building is considerable with most of the windows and glass doors chipped or broken out completely, and there is structural damage to the walls and ceilings. Robert A. Sandmeyer becomes dean and serves for 17 years, second in length of service only to Raymond D. Thomas. The Department of Accounting becomes known as the School of Accounting, a long-sought goal by Wilton T. Anderson, who had been head of the department since 1961. Enrollment peaks during the academic year with 5,267 full-time undergraduate students enrolled in the College of Business Administration. In addition, full-time faculty reaches its highest numbers ever with 133 members. Fulfilling its mission as a land grant university to teach, research and extend to the community and the world, the College of Business Administration and the Business Extension office begins its popular Tulsa Business Forums series. Two years later, the program expands to Oklahoma City with the Executive Management Briefings. Gary Trennepohl becomes dean of the College of Business Administration, serving until 1999 when he was asked to become president of the newly created OSU-Tulsa campus. He currently is Regents Service Professor and ONEOK Chair in Finance, and President’s Council Chair in Finance in the Spears School. Mikhail Gorbachev, former President of the Soviet Union, is the featured speaker during the Tulsa Business Forums and Executive Management Briefings in Oklahoma City. The College of Business Administration is renamed the Williams S. Spears School of Business. Today, the college is known as the Spears School of Business. A record 1,031 diplomas are granted at commencement exercises. Four students were in the first graduating class of the School of Commerce and Marketing in 1916, and the school has graduated students every year since. On May 5, Ken Eastman is named Dean of the Spears School of Business following a national search. Eastman has taught at the business school since 1989, serving as an assistant professor (1989-1995), associate professor (1995-2014), director of the MBA program (1999-2003), acting department head (2002-2003), and as the head of the Department of Management (2003-2014). On Sept. 5, in addition to celebrating 100 years of business education at OSU, the Spears School holds a groundbreaking ceremony for a new business building to be constructed just north of the current building. The expected completion of the new building for the Spears School of Business. The building will include 13 state-of-the art classrooms, a 150-seat lecture hall, nine student team rooms, eight faculty-student breakout rooms along with other amenities that will facilitate the foundation for stronger programs, more effective recruitment of top students and faculty, and stronger recognition on the international stage.